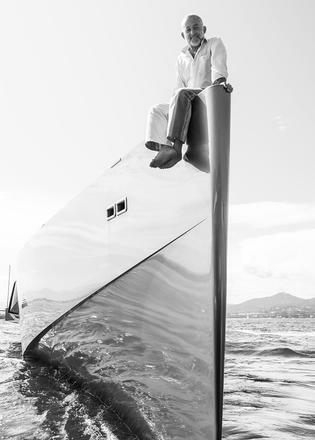 As the 2018 Superyacht Design Symposium draws near, we look back at one of last year's highlights, when Luca Bassani, founder and president of Wally, discussed his career so far — here's what we learned... 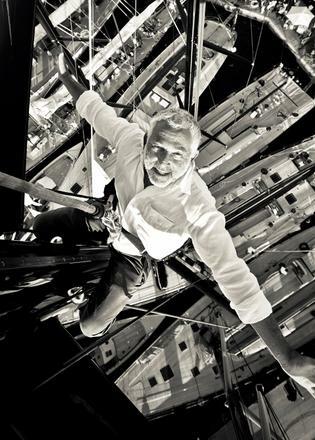 It has been well documented that Bassani founded his own company as he couldn't find the boat of his dreams. He expanded on this saying, "What I was looking for was simplicity and maximum sophistication. In my mind at the time, boats were too complicated, not comfortable at all, just designed and conceived to go through the oceans and the worst storms that usually you don’t want to find if you are sailing." It has been well documented that Bassani founded his own company as he couldn't find the boat of his dreams. He expanded on this saying, "What I was looking for was simplicity and maximum sophistication. In my mind at the time, boats were too complicated, not comfortable at all, just designed and conceived to go through the oceans and the worst storms that usually you don’t want to find if you are sailing." Wally's use of carbon fibre has been hailed as a revolution in yachting, a point that has been frequently repeated at the 2017 Superyacht Design Symposium. Bassani underlined the importance of new materials by saying: "Carbon fibre was very new at the time, it allowed me not only to create a lighter boat, but to reduce the sailplan as well." "Without new materials I could not do what I’ve done," he added. "It’s true that innovation is based on ideas and new concepts, but if you don’t have the new materials you don’t have a chance to realise your ideas." Wally's use of carbon fibre has been hailed as a revolution in yachting, a point that has been frequently repeated at the 2017 Superyacht Design Symposium. Bassani underlined the importance of new materials by saying: "Carbon fibre was very new at the time, it allowed me not only to create a lighter boat, but to reduce the sailplan as well." "Without new materials I could not do what I’ve done," he added. "It’s true that innovation is based on ideas and new concepts, but if you don’t have the new materials you don’t have a chance to realise your ideas." Bassani's reputation as a disruptor of the industry means that he is no stranger to taking risks, but it wasn't always this way, as he explained, "When I set up Wally the idea was the make only one boat per year, I didn’t want to take any risks." Although Wally started in sailing yachts, the brand has gained worldwide recognition for its Wally Power 118 yacht, which is regularly held up as a design icon. Bassani explained that the inspiration for this project came from one fateful meeting. 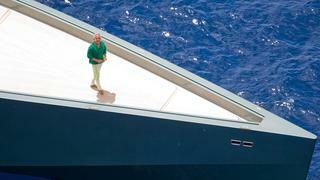 “We moved into powerboats because we knew that the sail market wasn’t big enough for our ambitions," he said. "The real inspiration came from the day a German client came into our our office in Monaco and said he wanted a powerboat with the same style, aggression and comfort. That clarified to me what a Wally powerboat could be." Although Wally started in sailing yachts, the brand has gained worldwide recognition for its Wally Power 118 yacht, which is regularly held up as a design icon. Bassani explained that the inspiration for this project came from one fateful meeting. “We moved into powerboats because we knew that the sail market wasn’t big enough for our ambitions," he said. "The real inspiration came from the day a German client came into our our office in Monaco and said he wanted a powerboat with the same style, aggression and comfort. That clarified to me what a Wally powerboat could be." 5 - He considers the Wally Power 118 to be "a flop" He considers the Wally Power 118 to be "a flop"
Despite the widespread critical acclaim for the Wally Power 118, Bassani was quick to describe it as a "flop" since it took him eight years to sell her on to her current owner, who renamed her Galeocerdo. 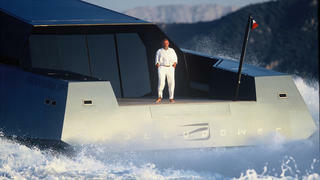 “The boat that probably has had the biggest media coverage in the world has been the biggest flop commercially," he said. "I built it for myself and had to keep it for eight years before I could sell it." When asked why he thought this design has had such an impact beyond the industry, he said, "You can see how clean the lines are — it looks like a model because you can’t see the antenna. This kind of purity has made the Wallypower so powerful among designers of all industries." Despite the widespread critical acclaim for the Wally Power 118, Bassani was quick to describe it as a "flop" since it took him eight years to sell her on to her current owner, who renamed her Galeocerdo. “The boat that probably has had the biggest media coverage in the world has been the biggest flop commercially," he said. "I built it for myself and had to keep it for eight years before I could sell it." When asked why he thought this design has had such an impact beyond the industry, he said, "You can see how clean the lines are — it looks like a model because you can’t see the antenna. This kind of purity has made the Wallypower so powerful among designers of all industries." Looking to the future and Bassani is well aware of the legacy that he will bequeath to the next generation, particularly his three children. However, his key advice to them is: "If you want to become a millionaire in boating, you should start as a billionaire."